On this site and in private lessons we always talk about theory based around the C harmonica. Here’s why. One of the great advantages we have as harmonica players is that we have separate instruments specially constructed to play in each key. 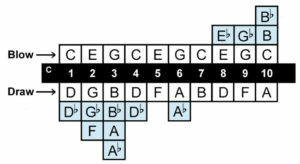 Also the relative note layout on each key of harmonica is the same. This means that if you play a major scale on a C harmonica then use the same breath patterns and hole numbers on a different key harmonica you’ll get the same major scale, just in a different key. Or to put it another way, to play in different keys we don’t have to learn new scale patterns, we just pick up a different harmonica. The practical effect for us as players is that we only need to learn the notes on one key of harmonica. To play in different keys, we pick up a different harmonica, pretend we’re playing the one we’ve learned and like magic, everything works out fine! Of course if you want to learn the notes on all the twelve keys of harmonica, that’s cool and I wish you luck. Here’s a chart with all of that information to get you started. Memorise those. It’s easier than you might think (here’s how) and the effort will pay off in spades.